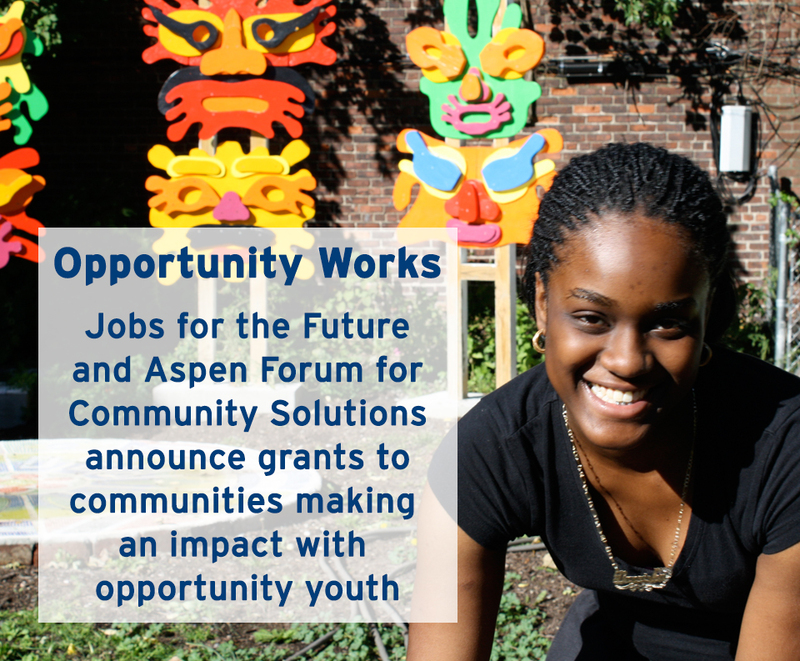 Hartford Opportunity Youth Collaborative has received $1.21 million in grant awards from the Social Innovation Fund (as a subgrantee of Jobs for the Future in partnership with Aspen Forum for Community Solutions), Hartford Foundation for Public Giving, and NBCUniversal Foundation for career pathway programming for 180 young men of color and young mothers (ages 18 – 24). These new investments will improve the quality of life outcomes of our youth, strengthening our economy, and promoting a thriving city. Hartford is one of seven community grantees taking a cross-system, cross-sector approach towards improving outcomes for young people with a particular focus on boys and men of color and will receive a three-year grant of $270,000 per year to further develop ladders to success for opportunity youth. 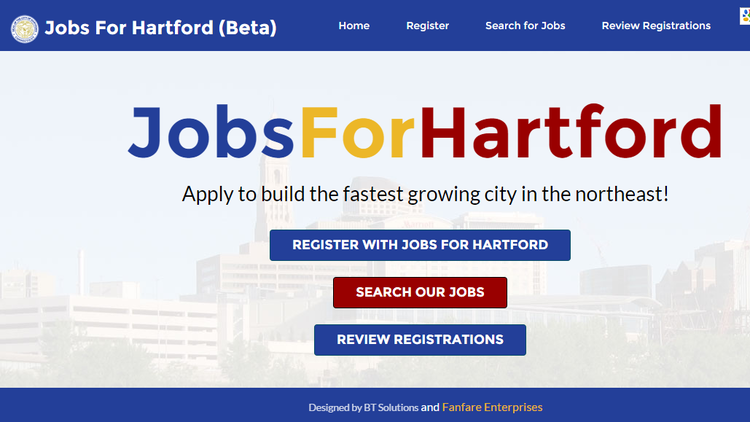 With leadership from City of Hartford and backbone organizational support from Capital Workforce Partners, the Collaborative will support older underserved young people through the new Opportunity Works initiative, a full pathway approach from high school credential to postsecondary /career bridging and technical training and job experience in two sectors – health care and manufacturing. Blue Hills Civic Association and Our Piece of the Pie will partner with Asnuntuck, Capital, and Manchester Community Colleges to deliver academic skill development, youth development, college credit-bearing instructional programs, internships, and jobs. For more information about the national Opportunity Works initiative, go here. Youth now have access to a legal office that can meet them where they are. 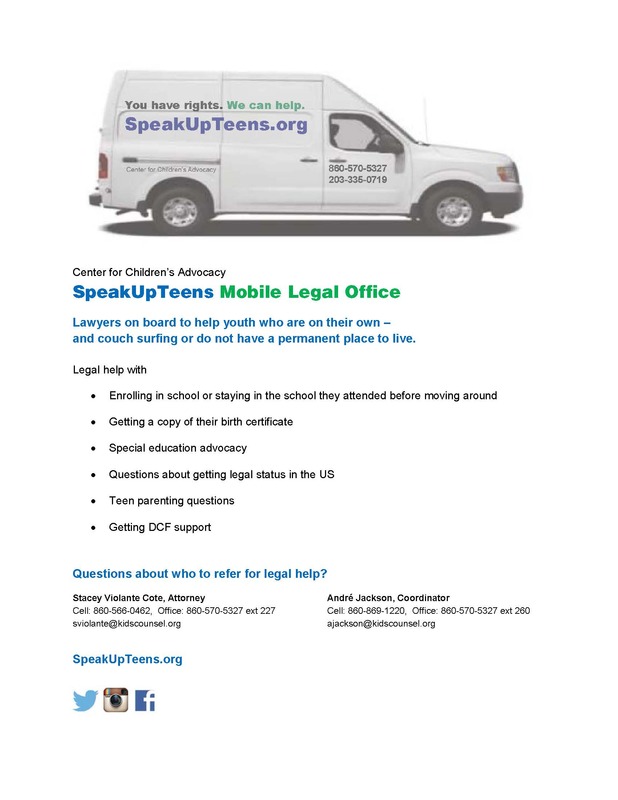 Center for Children’s Advocacy offers SpeakUpTeens Mobile Legal Office with lawyers onboard to help. See the flyer or go here for more information on the SpeakUpTeens Mobile Legal Office. Or, email Stacey or Andre directly at Center for Children’s Advocacy. 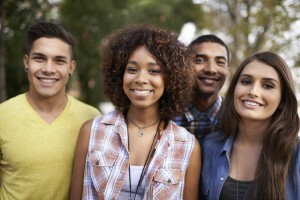 Our youth leaders created a Facebook page to promote the message of Reconnecting to Success. Keelishaye Downer, one of Hartford’s youth leaders, manages the Facebook page on the group’s behalf. She notes the page is about empowering young adults around issues of education and employment. It includes messages of motivation, unemployment data, and information on career competencies. Go here to “like” their Facebook page. 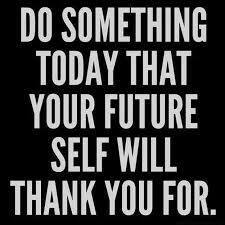 For more information about our youth leaders, e-mail Kelvin Lovejoy. As the year ends, it is a great time to reflect back on accomplishments made in the last year, provide updates, and reaffirm commitments for the new year. Connecticut’s United Ways released the ALICE report, a study of financial hardships in our state and finds that 69% of households in Hartford are not able to afford the basic necessities. Learn more about ALICE here. Learn about our plan to reconnect youth and their families to success here. The HBO documentary “Paycheck to Paycheck” spotlights the a year in the life of one ALICE family.